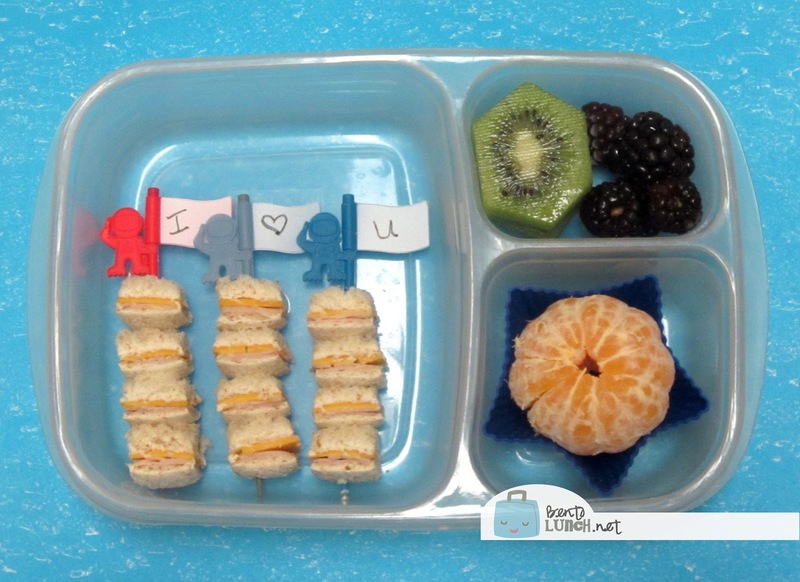 BentoLunch.net - What's for lunch at our house: Back to School and an Astronaut Bento! Back to School and an Astronaut Bento! And we are officially back to school! F&B headed off this morning and I am currently enjoying the silence, except for the puppy chasing his food ball around the living room. Ben and I headed to Target yesterday and found the most awesome astronaut picks in the Christmas clearance section! They were intended as cheese picks and the little flags can be written on with a marker (included in the packet). They were originally $12, but for 90% off? We came home with a set of six--two red, two grey-blue, two blue. Of course, that meant astronaut themed bento today. Ben has peppered turkey and cheese on honey wheat, cut with a FunBites Cube-It, and skewered on the astronaut picks. For reference, this is about 2/3 of a sandwich, since it looks minuscule when presented this way. He's been wanting more smaller/half sandwiches lately, and extra sides. Today's sides include a kiwi, a cutie orange, and some blackberries. Not pictured, he had Chobani Champions Honey-Nana Greek yogurt and an oatmeal Kids Clif bar. It's packed in our Easy Lunchboxes (also available on Amazon). So cute! I love those Astronaut picks! Woh, those cubes are the cutest!